Have a progress bar that updates the progress of the application as it runs. The background thread will need to raise events back to the main application to notify the application of the background thread progress. The progress bar will need to be updated to reflect the progress. The call to update the UI will crash because it is actually doing a cross-thread call, (the background thread, is trying to update the UI thread and this will crash. This will walk you through the pattern for implementing this solution. This as the name suggests is a thread of execution that runs in the background in the application leaving the UI thread to do what it is good at, UI rendering. If you were to try and have a method that processed 1000 records @ 2 seconds per record, and tried to update the progress bar on processing each record the UI would not render the progress bar as the UI thread is caught up in the process of doing the work. Doing the work on the background thread leave the UI thread to update the UI whilst the background thread gets on with doing the work. What is the background thread and how do I create one? First of all lets create a visual studio solution. I am going to create an empty windows form application called WorkerUtility. I will place the following controls on it. The background worker thread can be found in the toolbox under the “Components” section. Drag the background worker thread onto you form and you will end up with a control called backGroundWorker1. I am going to simulate processing a 126 items @ Random number of seconds between 0 and 2 seconds, by looping and pausing the background thread. You could be doing anything in the processing block, for example, read data from the database loop through the rows and perform file system tasks based upon the data? I will be performing work but each time an item is processed I want to tell the UI thread so that it can update the progress bar. To do this I will need to use events and I am going to create some custom event args. The main point of Interest in the following code is the creation of the event handler on the page with a delegate method declaration and an event handler. The RaiseEvent method is called on each file that is processed. Now we need to set up an event handler in the main form so we can update the UI when the event is raised. On the Background Worker Switch to the “Events” properties and double-click on “DoWork” to create the “DoWork” event handler. So this is where the tricky bit comes in. We need to implement the _ProgressUpdated callback. If we were to go directly to update the UI, we would get a cross thread exception and the program would crash. thread other than the thread it was created on. If you check the InvokeRequired method it will return true in this scenario so we need to perform a cross thread call to get from the background worker thread, that the “ProgressUpdated” event is raised on, to the UI thread to make the changes in the UI. This is done as follows, firstly you need a delegate for the method invoke method callback and an Update Method to handle performing the UI Update. 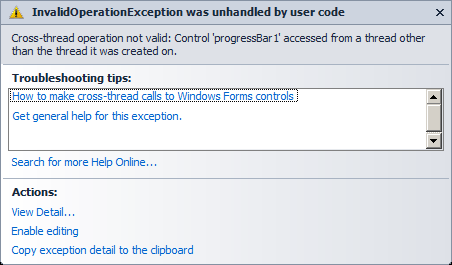 Here is the full working code sample in a VS2010 solution. I wrote a windows form application that deployed via an .msi installer. 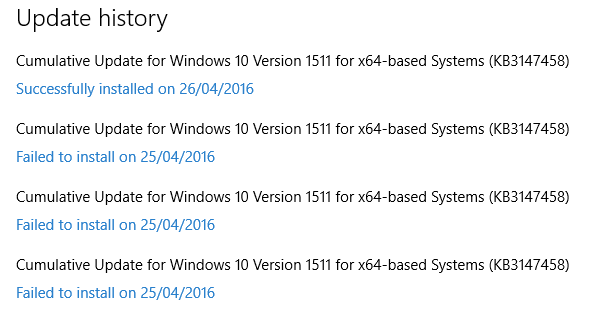 The application has an App.Config file which contains a single configuration value. I wanted to prompt the user for this value during the installation wizard and write it to the application.exe.config file as part of the installation process. 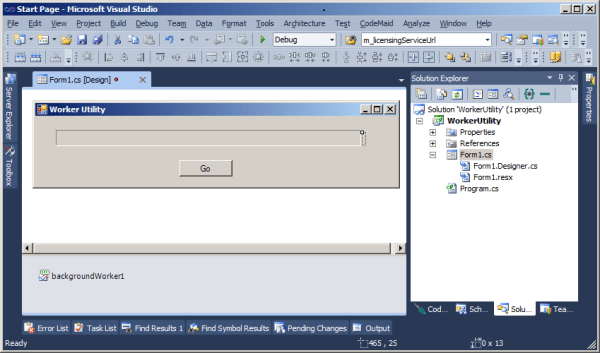 I used the built in Setup project in Visual Studio 2010. I essentially implemented the same solution but I wrote my .config file using a StringBuilder and deleted and re-wrote the.config file in the Post install custom action. The other thing is that I created short cuts to the application by right-clicking on the primary output and chosing “Create Shortcut”, then I copied this to the desktop and users program menu locations. I was installing this for “Everyone” and it would work fine for me, but when other people logged in and tried to launch the program the .msi would run and the application.exe.config file was being overwritten with the orginal version that was deployed with the .msi, which does not contain the users input. The problem is complicated and is related to the application short-cut. It appears that by default the short-cuts created in the msi are “Advertised ShortCuts”. According to microsoft when an advertised shortcut is activated “.. the installer verifies that all the components in the feature are installed before launching this file”. This means that if you delete any of the files that were deployed to the installation location then the .msi will attempt to fix them and re-install the missing components, which in my case means that the application.exe.config is overwritten. You can identify the “Advertised” short cut by looking at the “Properties” of a short-cut and the “Target” will be greyed out. I found the post below that identifies an easy way to disable advertised shortcuts. You need to set the “DISABLEADVTSHORTCUTS” property on the .msi. This can be done easily in the installer, by switching to the “user interface editor” and adding a custom textbox page to the UI. This does mean that you will have an empty step in your installation however, so think of some nice use for it like a warning message about this being a free product?? This updates the property table in the .msi and now all your short-cuts will be normal standard shortcuts. Another tip is to set the icon based on the icon embeded in your .exe. browse to the “Primary-Output for…” and choose OK. It will show you the icons embeded in your .exe and this way you don’t need to deploy a seperate .ico file. If you say “AutoSize=true” but set no MaximumSize.Width property it will just disappear off the right hand side of you form. Set the MaximumSize.Width and the control autosizes correctly and wraps the text in the label control. This is a bug with windows XP, caused by the dog animation, that appears by default when you perform a file search. I had a standard Windows Form Application with a ListView control on it. I setup a MouseMove event on the control. The normal way this operates is as you move the mouse over the control the MouseMove event fires. Stop moving the mouse and the event does not fire. Seems simple. Today however I noticed that the MouseMove event was firing repeatedly, even when the mouse was not moving!! I wrote a very simple windows form test app with only this code and put debug logging on the MouseMove event and found that it was not happening on some other machines. On the machine where things were going pear shaped I started closing applications until the only things open were some folders that I had been using, and the test app. It was still doing it. I closed all the folders and the MouseMove event stopped firing. Go “Change Preferences”, and choose “Without an animated screen character”, the dog buggers off and –> No problem. The animation must be taking control of the mouse and when it gives it back to my form it causes the mouse move event to fire. Thats 1.5 hours of my life I will never get back.